The Goulston Street Graffito is potentially an important piece of evidence in the Jack the Ripper case. It was located in the doorway of a building housing many Jewish residents, and above a piece of apron that had been taken from Ripper victim Catherine Eddowes. While it is true that chalked graffiti could be found throughout London at the time, that graffiti had been built up over a period of years. The Goulston Street Graffito, which could readily be understood as an anti-Semitic statement, would undoubtedly have been wiped away by a Jewish resident of the building before very long. It is therefore very likely that it was written on the night of the “double event,” and therefore very likely by William Bury, who was in the doorway of the building that night. There are two chief competing transcriptons of the graffito, one made by a detective, Daniel Halse, and one by the police commissioner himself, Charles Warren. 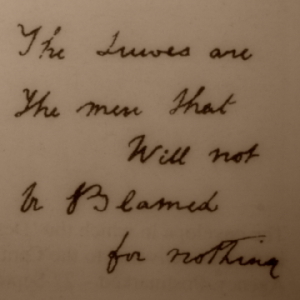 Halse’s transcription of the text (“The Juwes are not the men that will be blamed for nothing”) differs from the transcription made by Warren (“The Juwes are the men that will not be blamed for nothing”). The position of the word “not” in Warren’s version was affirmed by Police Constable Alfred Long, who was also at the scene and who also viewed and transcribed the graffito, Superintendent Thomas Arnold, who reviewed Long’s transcription, Chief Inspector Donald Swanson and Inspector James McWilliam. Hence, Halse’s transcription appears to be the one in error. Warren’s transcription reproduces the unusual capitalization of the word, “blamed,” while Halse’s transcription does not. If Warren had produced a casual or “lazy” transcription of the graffito, he would not have bothered to capitalize this word. Instead he would have written it out without the capitalization, as both Halse and Long did. Hence, Warren’s transcription shows a level of attention to detail not found in the other transcriptions. Halse and Warren also seem to give different accounts of the number of lines in the graffito. Halse produced a transcription containing three lines, but at the Eddowes inquest he indicated the graffito contained “about three lines.” In Warren’s transcription the graffito contains five lines. Since Halse’s inquest testimony shows that he was uncertain about the number of lines in the message, Warren’s five lines should be preferred. How could Halse have looked at a message containing five lines and produced a transcription containing three lines? The Goulston Street Graffito was very likely written in near darkness, and it’s reasonable to expect that the left margin and line indentations would have been irregular and potentially confusing to a person transcribing the message. It’s possible that this caused Halse to view the third and fourth lines as continuations of the second, and that he appended them to the second line, resulting in a generalization about the number of lines in the message rather than a faithful representation of their visual appearance. For example, the “seller” chalking at the back of William Bury’s residence in Dundee has four lines (the chalking is reproduced on page 249 of William Beadle’s Jack the Ripper Unmasked and in the set of illustrations in Euan Macpherson’s The Trial of Jack the Ripper), the fourth line, containing the single word “seller,” being clearly indented, which could cause a transcriber to view that word as being merely a “run on” or extension of the previous line. A generalized transcription of this graffito could then have added the final word, “seller,” to the third line, resulting in a three-line transcription of a message that was actually four lines long. If Halse’s transcription indeed contained this kind of reduction of the number of lines, it would explain why he said the message was “about three lines” and not simply “three lines” at the Eddowes inquest. It wouldn’t account for Halse and Warren giving different final lines in their transcriptions, Halse giving the single word, “nothing,” and Warren giving “for nothing,” but since one of the two men made a mistake with the position of the word, “not” (almost certainly Halse), it’s reasonable to believe that one of the two men could have made a mistake with the composition of the final line (presumably Halse as well). In summary, the apparently mistaken placement of the word, “not,” in Halse’s transcription, his uncertainty about the number of lines in the message, and his relative lack of attention to detail should cause us to set his transcription aside. Charles Warren was the police commissioner at the time and was clearly aware of the potential significance of the graffito. He was the person responsible for erasing it before it could be photographed, and he would have personally borne the brunt of any negative consequences that could have arisen from that decision. Hence, he would have had a much stronger motivation than Halse to carefully and accurately record the text of the message. Barring some compelling reason to disregard Warren’s transcription, and there is none, his transcription must be viewed as the authoritative transcription of the Goulston Street Graffito. The markedly vertical structure of the Goulston Street Graffito and the “seller” message in Dundee is a good reason to believe that William Bury chalked both of them.